The flowchart is the third and final approach to modeling processes. In many ways meeting the best of the narrative and step-by-step approaches, but adding “the big picture” to the equation. 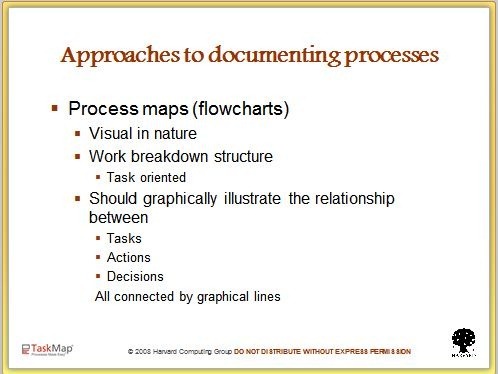 Flowcharts are visual in nature, and regardless of the details, all make the task (sometimes call a process or activity) the core element. 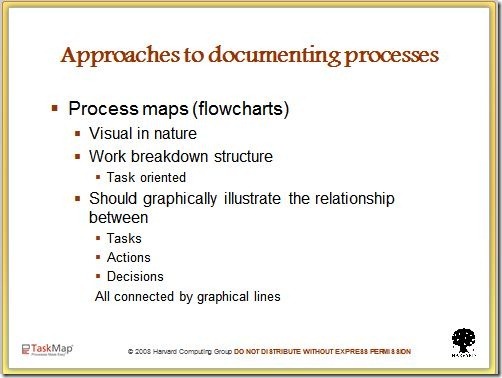 A good flowchart shows a Work Breakdown Structure (WBS), showing how the work is to be done. A flowchart graphically illustrates the important relationship between tasks, actions and decisions. Linking the outcomes by graphical lines known as task links or connectors.